Indoor training on your bike has launched into new territory - no longer forced to spend your time watching Netflix reruns, keeping your summer fitness or working towards a great spring on the bike has been made much more enjoyable. Get the lowdown on the latest in electronic controlled power trainers from Wild Rock. By now you may have heard a few words floating around - smart trainer, power trainer, Zwift - what does this all mean?!?! Here is the best way to think about the new trainers out there! A trainer that calls itself a Smart Trainer (CycleOps Fluid+, Kinetic Road Machine Smart) generally refers to a trainer that sends a signal to a cycling computer, app, or to software to display things like speed, distance, cadence or virtual power output. This is different from an Electronic Controlled Trainer or Power Trainer. (Cyclops Magnus, Cyclops Hammer, Wahoo Kickr series) in which the trainer is controlled by an app or by software (like Zwift) to change the level of resistance automatically as you ride. That’s the long and short of the lingo! The CycleOps Hammer is a Electronic Power Control Trainer that connects to all your favourite training software to give you the most realistic ride experience! Its direct drive design (rear wheel off) allows for low noise, easy of set-up, and great compatibility between bikes. $1619. 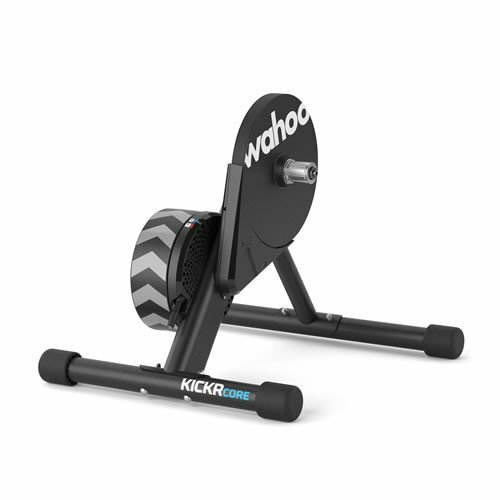 Following in the footsteps of its older sibling, the Wahoo Kickr Power ($1699) the new Kickr Core from Wahoo features a direct drive design, and the great features and construction you expect from Wahoo at a lower entry price for an Electronic Power Control Trainer at $1199. A wheel on version of an Electronic Power Control Trainer offers a lower price point in comparison to the direct drive models. The biggest differences you will notice are increased trainer noise (still very low) and the requirement of a trainer tire to avoid wearing out your good rubber for cycling season! Zwift is what really changed the game of indoor training. The Zwift program allows you to ride in a virtual world, whether that be social group rides, structured workouts, or challenging yourself on some epic climbs. Zwift communicates with your Electronic Power Control Trainer to replicate what is happening on the screen - climb of 10% gradient, yep you will feel it! Setting up your new trainer can take a bit of work, but don’t worry we are here to help! In the cycling world the Domestique is the helper, there to take care of the team leader through thick and thin, and along that vain we launch our Domestique Service - to help you get set-up and ready to ride on your new trainer. Book an appointment and our Super Domestique will come directly to your home and walk you through both hardware and software set-up. It’s like GeekSquad for bikes! Domestique Service Fee is $49.99.